What do you think??? Not bad for my first time, huh?? Last night, my kitchen turned into a bakery, and it was a ton of fun. 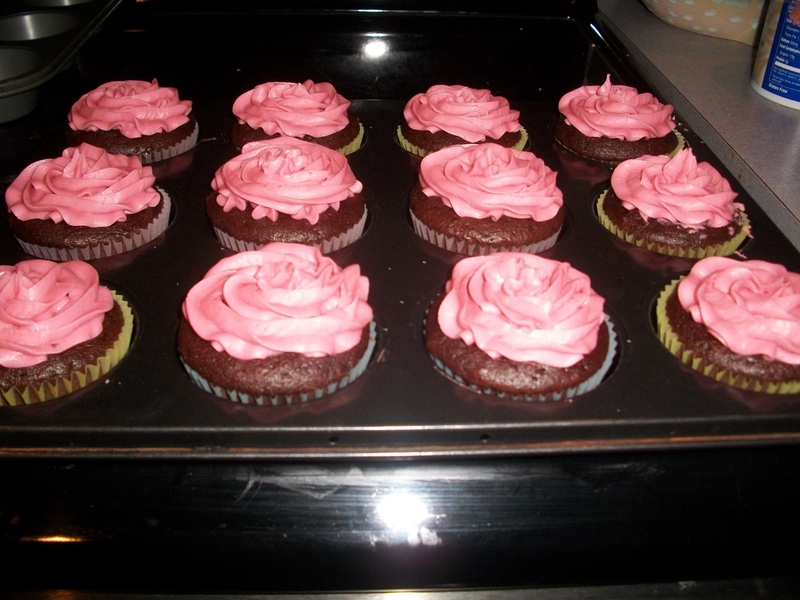 I am planning to make my own cupcakes for my wedding (with the help of friends), and last night was a trial run. I’ve been trying to research recipes and think of things that would be a safe choice. After finding a recipe from Courtney’s blog, I decided to give them a try. I didn’t add the almond extract like her recipe called for just because of allergy issues, but they were sooo delicious none the less! 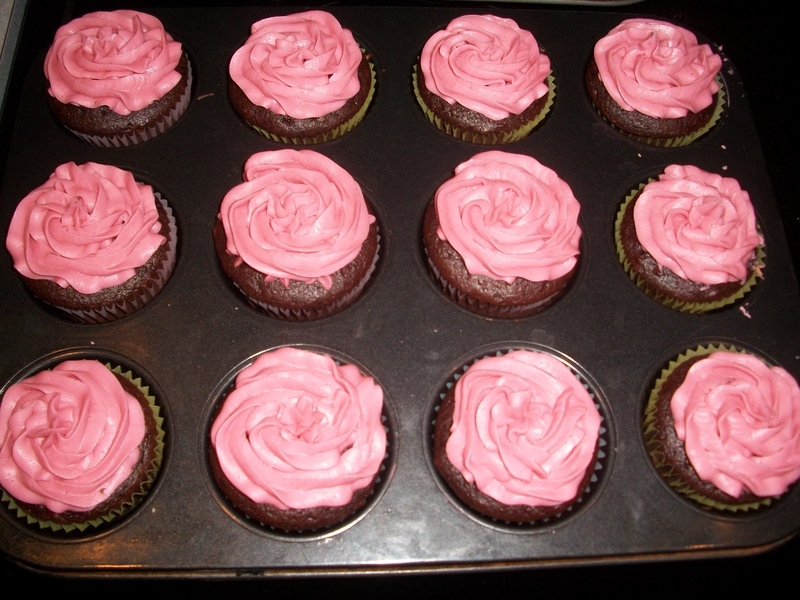 Chocolate raspberry cupcakes with raspberry buttercream frosting. 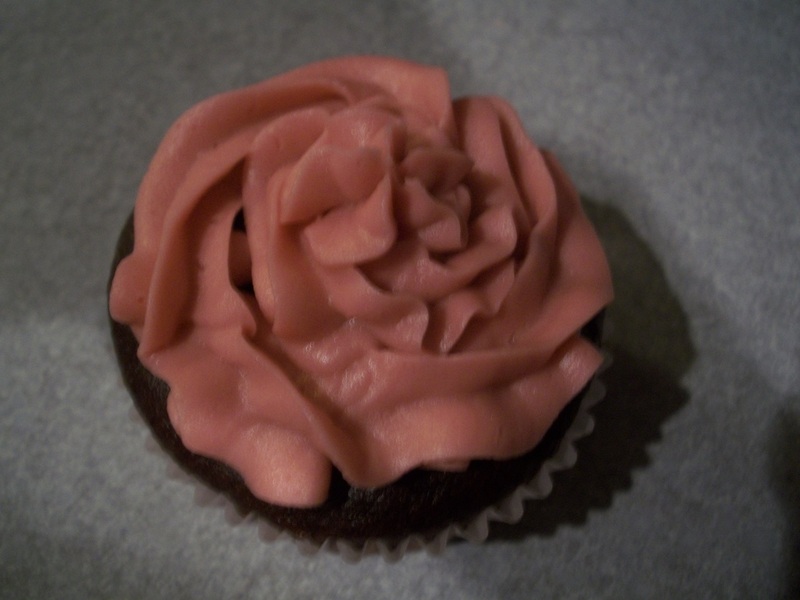 My mom got me some decorating tools two Christmas’s ago, and I was able to test them out on my cupcakes. After doing the design a few times, I got the hang of it, and I think they look pretty fancy. 🙂 I am also planning to add some decoration to the top and possibly a decorative foil or wrapper to the outside. For now, I’m thinking this recipe is a keeper. I am planning to do two different ones, so any suggestions for a second cupcake would be wonderful! I sent the tray below with my mom to work to share with her coworkers for their Tuesday meeting. Moving on to today. As a result of the cupcake overload, a LONG walk was in store for me. Around noon, I headed out with my iPod for a five mile walk. It started out windy and cold, but after I got going, the temperature felt perfect. I was really in the zone and felt like I could have walked all day long! When my mom got home from work, she wanted to go for a walk, so I made the decision to head out again with her for a few miles. When we got home, we decided to make a trip to Target. Our Target recently added a grocery/produce section that was opened this past weekend. As someone who is obsessed with grocery stores, this was a huge deal. I had already gone and checked it out on the weekend, but I had to show mom too. 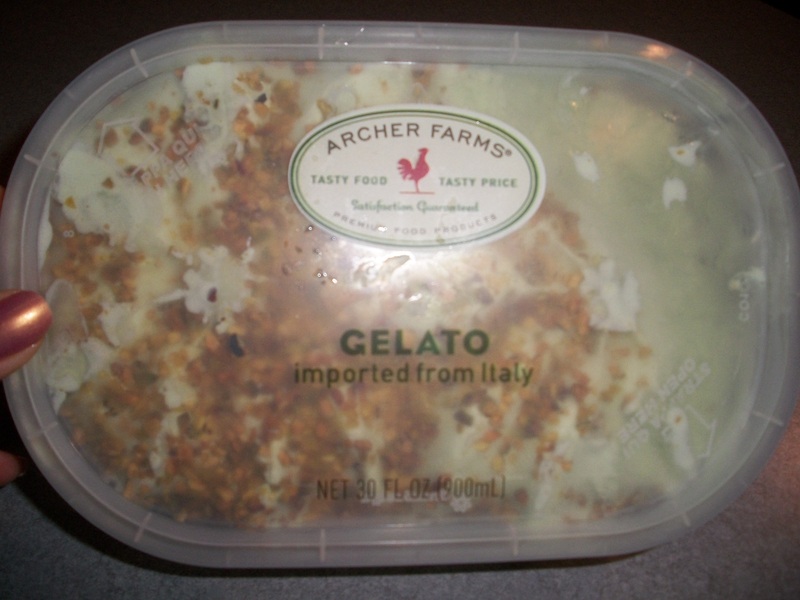 We snatched up some gelato ice cream (pistachio flavored) and some other goodies too. The ice cream was so creamy and full of flavor. I’ll definitely be trying out their other flavors soon. I’m not a huge sweets/ice cream person (even though this post is filled with it! ), but all I need is a few bites to be satisfied. That’s about all for tonight. In the morning, my mom and I are going to head out of town to do some wedding shopping, go for lunch, etc… I’m really looking forward to it! Today was such a relaxing and fun day. After getting up and getting ready, I grabbed a quick breakfast before heading out the door to visit Julie. 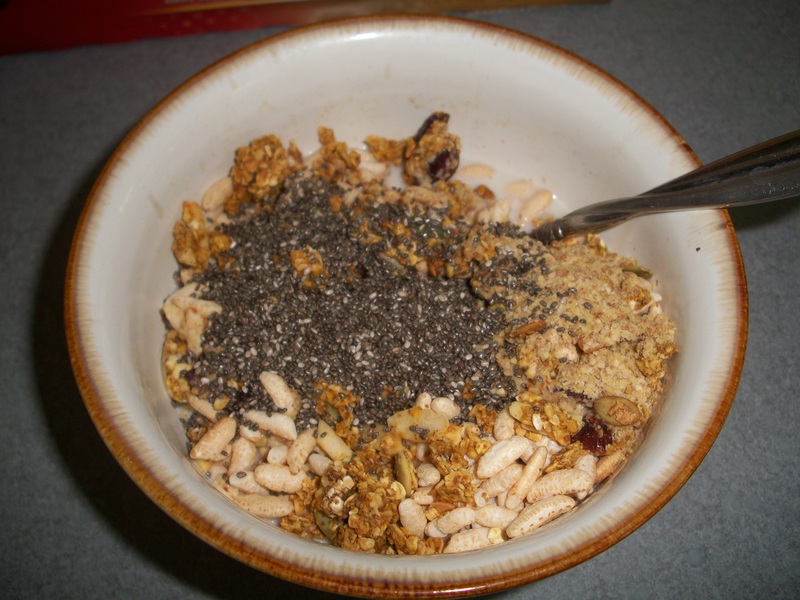 Breakfast-puffed rice cereal, wheat germ, homemade pumpkin granola and chia seeds. All of it was topped with almond milk. Today once again confirmed how similar Julie and I are…I think we were meant to be sisters, but now get to be sister-in-laws instead! I feel so lucky to have such a great person like her in my life. We met at Kohls and then made our way to the mall before heading to lunch at Olive Garden. Olive Garden is one of my all-time favorite restaurants. Julie and I had met up about 6 months earlier to shop and ate at Olive Garden and pretty much ended up in the same spot as last time…but this time I was engaged!! How fast the time goes. We both started out with their delicious garden salad, and I chose the mediterranean chicken for my entree. This was a new choice to me, and I didn’t regret it! The leftovers were just as good tonight for dinner. While shopping, Julie and I ended up buying the same clearance jacket for $10…what a deal! We also went in on some 5 for $20 basic shirts. We were able to do some wedding planning verbally and decided that we will be seeing each other next weekend when Korey is home. I can’t wait to have everyone together again…what could be better?! Thanks for a fun day, Julie. After I made the sunny drive home from being with Julie, I knew I wanted to get my workout in so I could relax for the rest of the night. I did 10 minutes of weights and finished off with 20 minutes on the treadmill. The rest of my night has consisted of looking around for wedding shoes online. It is such a struggle to find what I’m looking for. I’ve gone to some stores in town and also looked in a few stores with Julie today, but nothing is quite what I’m picturing. Here are a few I found online. Leave a comment and let me know what your favorites are!! Hi, I'm Leah. Thanks for stopping by my blog. I am a health and wellness grad and nutrition nut who loves educating others. DeLeahLicious is all about eating well without sacrificing taste. Join me as I continue to pursue a healthy life filled with fitness and delicious foods.